A DIMM graduate is trained to care for injuries and illness in alpine settings and to provide advice and direction to mitigate or preempt medical problems in mountain environments. A graduate of both the Winter and Summer CSMM modules receives a Diploma in Mountain Medicine from ICAR/UIAA and CME credits awarded by the Faculty of Medicine, University of British Columbia. The program starts with pre-course work assignments, we then have two days in class, followed by four training days in the mountains. Evaluation of candidates is continuous and periodic constructive/ success oriented feedback will be frequent. We have between 8 and 15 students per class. We have a number of instructors for lectures and small group discussions. The mountaineering and climbing sessions are led by our lead mountain guide who is a fully certified international Mountain Guide; IFMGA/UIAGM, (the International Federation of Mountain Guiding Associations) as well as a member of the Association of Canadian Mountain Guides (ACMG). We aim for a 5:1 student / guide ratio and similar for small group sessions with instructors, but sometimes we have 2 instructors per session. Students are expected to have some climbing, mountaineering, skiing skills prior to taking the course. Ropes are provided by us. Students are responsible for their travel to/from the course location. The DiMM course modules are geared to physicians, but we also accept Physician Assistants, Nurse Practitioners and Advanced Care Paramedics, but the material is taught to the physician level. In order to receive the diploma you must attend and pass the winter and summer modules, and have obtained passing grades on all the written assignments. Applications and $100 non refundable application fee. Course confirmation based on minimum student numbers will be decided by this date. Early bird discounts are available. At the course host hotel and/or remote mountain lodge or hut. To remote sites via helicopter, snow cat, snowmobile, etc. depending on the location. Including breakfast, lunch and the dinners at the remote lodge or hut locations. Dinners while at the hotel are not included. Introduction to the course, hypothermia clinical presentation, hypothermia management, management of cold injuries, Wilderness ATLS and airway skills. (classroom day). Full day in the field focusing on safe travel in avalanche terrain and avalanche rescue scenarios, including medical management of the victims. 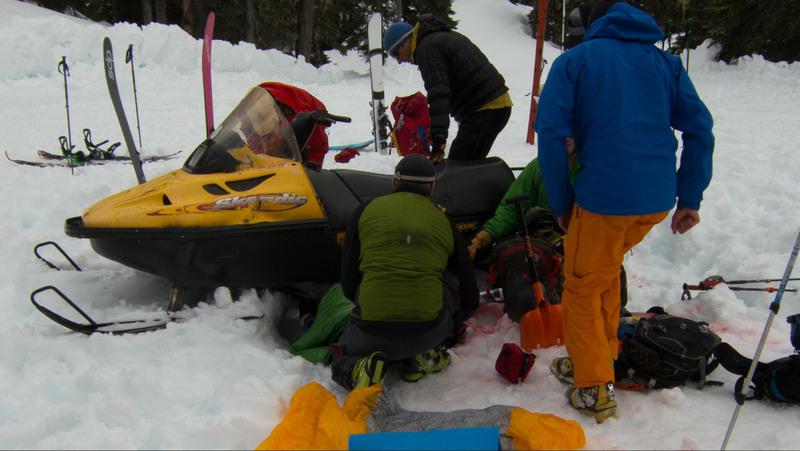 Lectures and small group workshops on orthopaedic injury management, patient packaging in both organized and improvised rescue, analgesia in the backcountry, small group scenarios for practice. Then an evening at the local climbing gym for rope skill practice. Full day outside with the guides covering self arrests, snow anchors, snow shelters, crevasse rescue. Then avalanche theory review in small groups after dinner. Travel into the backcountry in small groups with scenarios along the way. Then back for dinner and course review. 75% Refund if cancellation is received 90 DAYS prior to the course commencement. 50% Refund if cancellation is received 60 DAYS prior to the course commencement. NO Refund for cancellations received with less than 60 DAYS notification. All attendees and applicants are advised to secure travel or other cancellation insurance available through various suppliers or perhaps your credit card will provide the coverage. You are responsible to check that you have coverage for cancellations. General CSMM policy is that cancellations will incur a minimum charge of a $ 500.00 administration fee or the charges based on the refund policy noted above. The cost to prepare for a course and pre-book accommodation and other resources requiring deposits (i.e. mountain guides or other subject matter experts) dictates the refund policy noted above, as CSMM operates as a non-profit organization and cannot absorb any losses. Note: Under extenuating circumstances a COURSE FEE PAID may be carried over to a future course less a minimum administration fee of $ 500.00 plus any costs incurred for prepaid expenses i.e. hotel, back country lodge, mountain guide, etc. candidates are encouraged to register early to avoid the wait-list and possible disappointment.